I was on a quest. . . I was like a hound dog on a hunt but I couldn’t find what I wanted. I’m what I like to call determined (stubborn). After three weeks of searching Lowes, Home Depot, Wal-Mart, and several plant nurseries I was just about ready to give it a rest. . . for a while. I spotted the basil on a shelf at Home Depot. He ( yes he, what else would you call a Basil) looked so wimpy and wilted. His feet ( that’s roots for non-plant people) were as dry as a bone. The soil was pulling away from the pot. I picked him up and decided then and there he was going home with me. I grabbed him and then I spotted her . . . Rosemary. She was on the bottom shelf . . . all by herself. Her feet were dry too but she wasn’t acting wimpy just so she’d get attention. I grabbed her and proceeded to the check out. I was going to adopt them and make sure they got the care they deserved. Once we got home we gave each a hearty drink and some TLC. Within minutes Basil was standing tall and perky. . .Rosemary was . . . well. . .just Rosemary. I came to the conclusion that in the plant world , even though they were in the same family — herbs from the Mediterranean region — they were polar opposites in needs and behavior. . . somewhat like women and men. 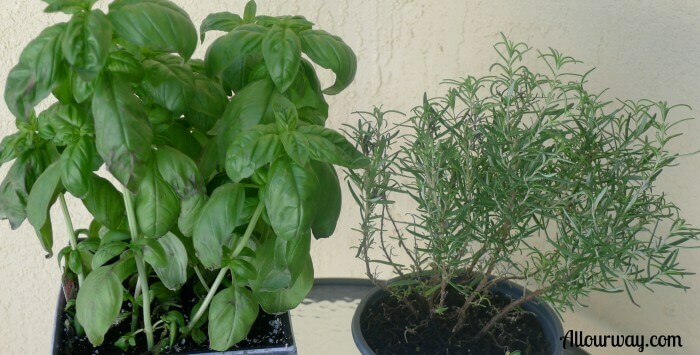 Rosemary thrives in hot dry weather whereas Basil will react like he did at Home Depot. I needed to snip some cuttings from both plants so that I could start propagating them. Rosemary didn’t need much pruning . . . figures. . . Basil needed quite a bit. 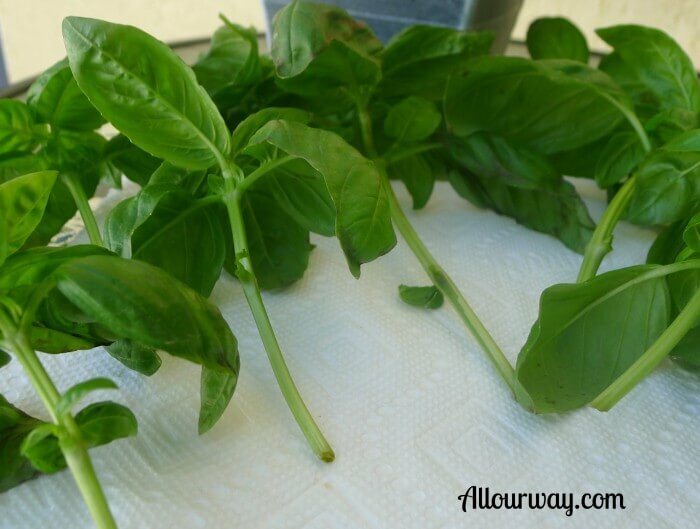 When you cut the stems make sure you have enough of a stem to put into the water. The plant will root from where the lower leaves were attached. Pluck off those leaves and use for your cooking. Place the stems in a glass of water . . . one for the Rosemary and one glass for Basil. In about two weeks you will see roots starting to form from the nodes . . . that’s where the leaves were. You’ll have to change the water occasionally. Once the roots have formed and they are long enough, you can pot the plants in a container or directly into the ground. 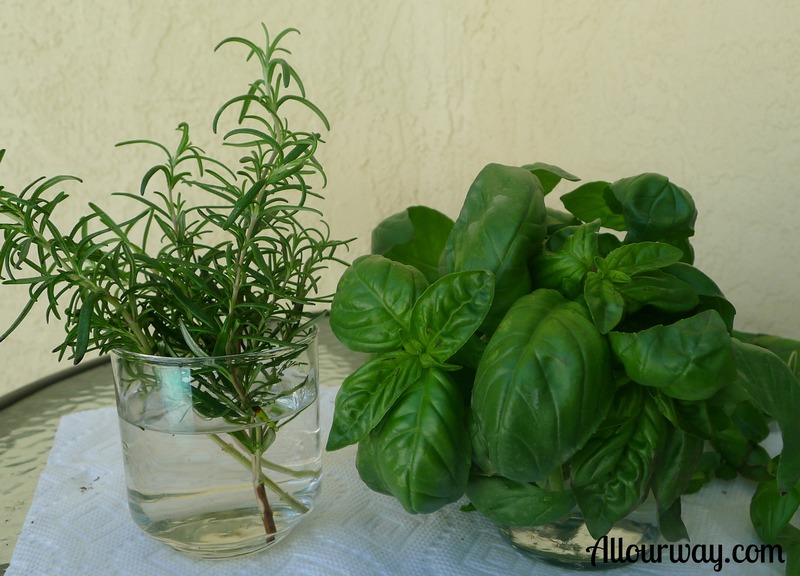 You can have Rosemary and Basil throughout the growing season. Rosemary is a semi-hardy perennial and if you have mild winters you’ll be able to keep it year after year. Basil is considered an annual and a frost will kill it. . .figures. Trader Joe’s also has very hearty basil plants! Thank you for the info. The stems that I started in water have rooted and we planted in the soil. Rosemary is used as shrubs here in the Scottsdale AZ area….Delightful fragrance! I wish we could keep the rosemary from year to year but up north it seems the winter’s are getting more severe. I live in Northwest Indiana about 90 miles south of Chicago. Because I have a heavily wooded lot, I grow my basil and rosemary in pots on my deck. Before we get a hard freeze, I give them a good “haircut” (saving the pieces I cut off to start new plants), and bring them inside. I place them in front of my sliding glass door going out to the deck, and there they stay all winter. I have fresh rosemary and basil all winter. Only twice in the last ten years did I have a basil plant get “woody” on me, and I had to toss it. The rosemary–never a problem. You can get basil almost any time of the year from The Tasteful Garden, on line. Depending on where you live—they won’t ship during bad weather to my area. Thank you Diane for the info on Tasteful Garden — I’ll look them up. We live south of Indy so our winters are pretty harsh also. We also would bring some our plants in for the winter but we’ve become snowbirds — the species that get’s out of Dodge the minute there is a sign of snow. We’ll be going back North the first week of April. Some of our larger plants we’ve placed on the “drip” method in the garage and it’s worked so far. 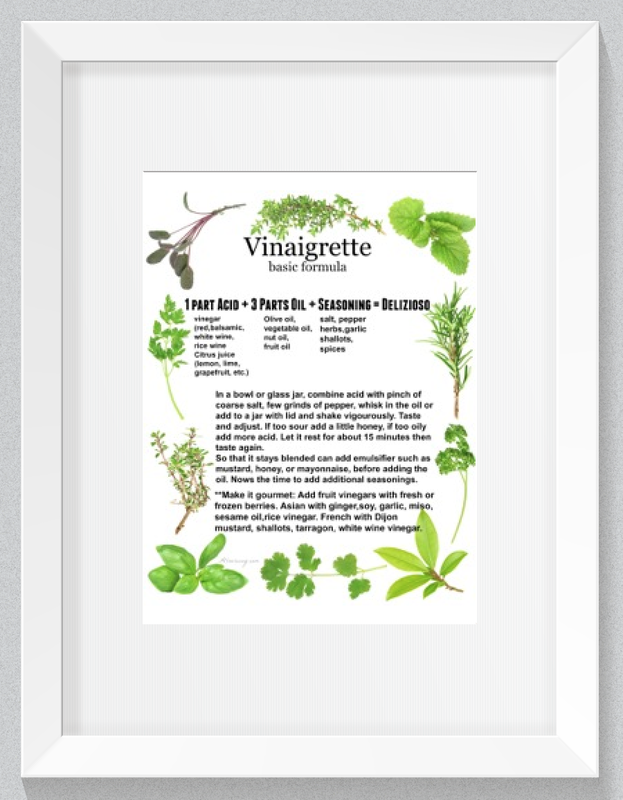 Don’t you just love having fresh herbs?! I do love fresh herbs!! guessing if I had Rosemary outside this winter, it would not make it. If you’re north of the Kentucky I would say your Rosemary did not make it. When we have mild winters in the Midwest they will survive. We had one plant for about four years and then we had a big ice storm then a hard freeze — goodbye Rosemary.